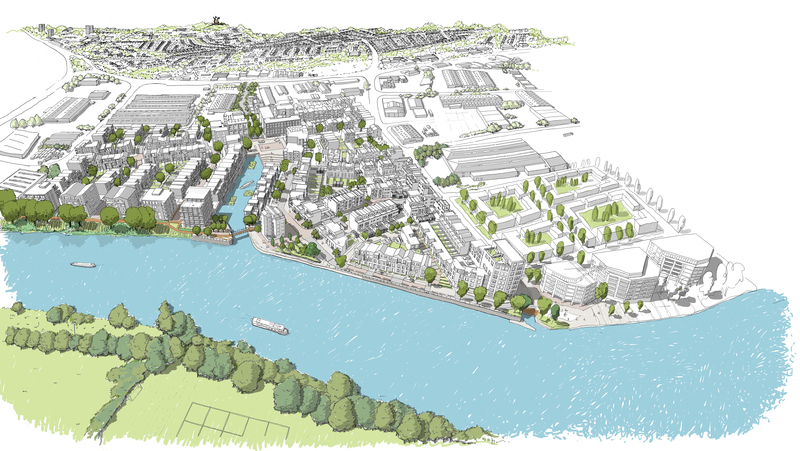 Building on our work with Blueprint on Trent Basin, we are delighted to be one of eight partners in this multi-disciplinary, collaborative project funded by InnovateUK. Project SCENe (Sustainable Community Energy Networks) seeks to accelerate the adoption of Community Energy Systems, using the Trent Basin site as a new housing development test bed to bring together technical knowledge, implementation and installation of renewable heat and electricity technologies as well as energy storage at this community-level scale. It also aims to bring together all the companies involved in the energy supply chain with the potential buyers of up to 120 homes on site. As masterplanners of Trent Basin, we are one of the project partners, providing our knowledge and advise with regard to the integration in the urban fabric of the proposed technologies, especially as the housing development is already taking place with Phase 1 near completion. This is a 2-years project, started in June 2016. The other project partners are: A.T. Kearney (project lead), Siemens, Blueprint, University of Nottingham, Stickyworld, Smartklub, Solar Ready and Loughborough University.